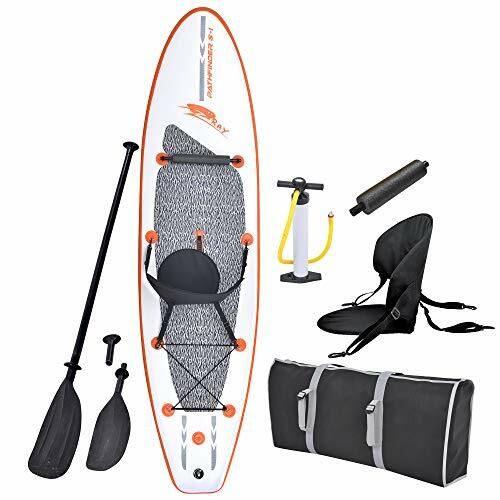 The Wakooda gets high marks for overall portability—the deflated SUP, pump and paddle fit neatly into the included backpack, which is easy to carry and store. 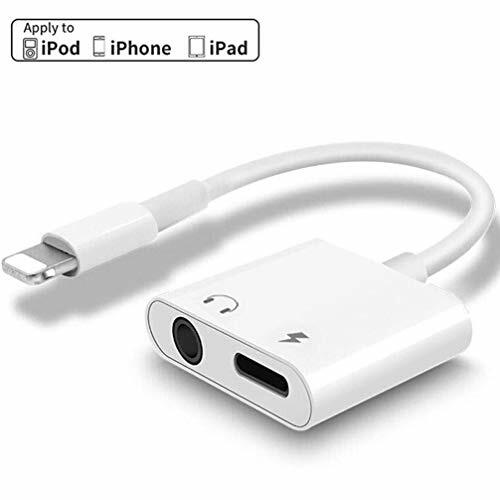 The pump is uniquely efficient, expressing air when both pushed down and pulled up. As for performance, its lighter weight (just 22 lbs.) and 30” width make it as agile as a dragonfly on the water. To further increase its agility and ensure it remains stable, the front end is pointed, allowing it to gain speed by cutting through the water when the water is calm, and angled up by 5°, letting it ride atop the waves in choppier water. The Stingray is a hybrid SUP, meaning it has a removable seat back so you can sit on it like a kayak if you want. The back end also has a lot of storage space, making it one of the best inflatable SUPs for fishing. However, at only 4 inches thick, the Stingray is one of the thinnest inflatable SUPs out there. The thinner the board, the lesser the weight capacity. Though its maximum load capacity is listed at 220lb, we don’t recommend you push the limit with a 4” thick board like the Stingray. At 35” wide and 6” thick, the Astro Whopper Deluxe offers superior stability for a 10’ all around inflatable SUP. Not only is it the widest we’ve seen, it’s also the most ideal shape for maneuverability. Flat and wide in front with a narrow tail end, the Astro Whopper will make even the least experienced rider look and feel like a pro navigator. The package includes three removable fins that you can put on for an extra bit of stability, or take off to save space when you pack up. The bag it comes with is wheeled and oversized, making it easy to pack up and haul around. Intermediate to advanced SUP riders need look no further than the 10’ Vilano Navigator. A gorgeous board, it comes in three different color combinations - blue/gray, gray/orange or white/blue. The Navigator’s diamond groove traction grip ensures your feet won’t slip off the board, which is good considering the package does not include an ankle leash. The included paddle, though a bit heavy and awkward for beginners, breaks up into 3 pieces for more convenient storage in the carrying case. Increasing the Navigator’s portability is its removable slide-in bottom fin. Our favorite part was the storage; with 4 D-rings at the back and 3 in the front, all you need is a couple of bungee cords to carry just about anything along with you for the ride (just keep in mind the 250-lb. weight limit). Like the majority of all-around SUPs, ISLE’s is ten feet long (hence the name) - ideal for quick turns and easy maneuvering. This board has an edge over its competitors in terms of width; while most all around SUPs (excluding the Astro Whopper) are 30” wide, this one is 31”. One inch might not sound all that impressive until you get out there on the water, where every inch counts toward balance and stability. 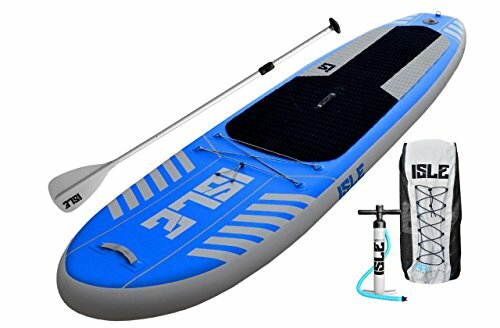 At just under 18 pounds, this is the lightest inflatable stand up paddle board you will find with such high quality. Despite its light weight, it’s still 6” thick and can hold up to 240 lbs. thanks to ISLE’s advanced stitching technology. Included in this package is an adjustable travel paddle, a pump, and a backpack carrying case. When deflated, this SUP will fit neatly into the bag and can easily be stored in the trunk of a sedan. 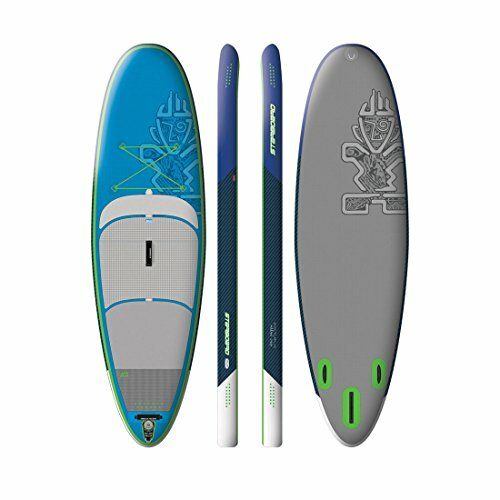 Every inflatable stand up paddle board has its pros and cons, as you can see in each of these paddle board reviews. But whether you want to race your friends on the lake, chase the next bend in the river or have a relaxing sunset yoga session in the cool surf, you can’t go wrong with an inflatable SUP. Now that you know what to look for and have seen five of what we consider the best paddle boards, go find the best inflatable paddle board for you and get out there on the water!